There are war stories. There are Resistance stories. There are soldier or spy or leader or civilian bystander stories. There are refugee stories. There are family stories. There are concentration camp stories. There are tragedies and apologies. Just when you think there can't possibly be another unique story to be told about WWII and the atrocities of the Holocaust, a tale unlike the others comes along and proves you wrong. 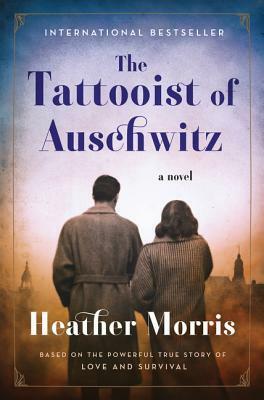 Heather Morris' The Tattoooist of Auschwitz is one such story. Yes, it is a concentration camp story but it is also a love story, a survival story, a life story, made even more interesting by being based on a true story. Would you tattoo your fellow Jews? What is the cost of doing so? Can any good come from being a Tatowierer? Lale Sokolov was sent to Auschwitz in 1942. He was an educated Slovakian Jew who spoke several languages. Catching the eye of the camp Tatowierer (German for tattooist), a fellow Jewish prisoner, Lale learns to tattoo other incoming prisoners, leaving his work forever on the skin of his own people. His position affords him certain privileges, which he uses to try and alleviate some of the horrific suffering in the camp. Then one day a beautiful young woman is sent to him to have her fading tattoo re-inked. Lale falls hard for Gita and is determined that the two of them will survive the atrocity of the camp and make a life together. In his position as the camp tattooist, Lale has access to many different parts of the camp, allowing him access to the possessions of the murdered which he uses to buy extra food and medications for his fellow sufferers, and to German higher-ups, which gave him the opportunity to get Gita a less strenuous job, one which ultimately probably helped keep her alive. The two and a half years in the camp are full of harrowing occurrences, with both Lale and Gita coming to the edge of death at different times. But through it all, Lale remained completely devoted to Gita and to staying alive for her. This was first written as a screenplay and it shows in its dialogue heavy writing and stage direction like actions. For a tale of love and hope in the midst of horror, it is somehow oddly emotionally flat despite its subject matter. It feels very simplified, only skimming the surface and telling the big picture without looking directly into the heart of it all. The character development is lacking too, almost as if, despite selling this as a novel rather than a biography, Morris wasn't willing to stray too far from Sokolov's reminiscences and fill in the blanks where he chose not to go. This makes it hard for the reader to really connect with Lale and Gita fully, viewing their story from a remove that unfortunately dulls the immediacy of their experiences. The history of the Holocaust is incredibly important and one we should never forget but it should be told in a way that grabs a reader, forcing them to face the reality of the genocide and the strong emotions this brings. This novel just doesn't do that. Instead it is like Gita's tattoo in the beginning, indelible yes, but fading so that its impact is blurred. I am not entirely alone in my opinion but certainly the majority opinion seems to be the exact opposite so if you are a WWII aficionado, maybe you'll like it better than I did. It is interesting to note that both Lale and Gita's only son and some serious historians of the Holocaust have taken issue with the purported "facts" of this book. Author Heather Morris' contention is that it is a novel only based on Lale and Gita's story and not a history.